Accent your sofa with this delightful cottage-style end table. Clean lines, and tapered legs are contrasted with gracefully curved metal stretchers for stable, long-lasting support. A silver nickel and antique mirror finish puts a vintage spin on this contemporary piece for a charming style. Topped with a reflective mirror surface, this table is ideal for showcasing artwork, decor, or a reading lamp with a distinct vintage treatment to add character. Pair with the matching vintage silver cocktail table for the complete style. 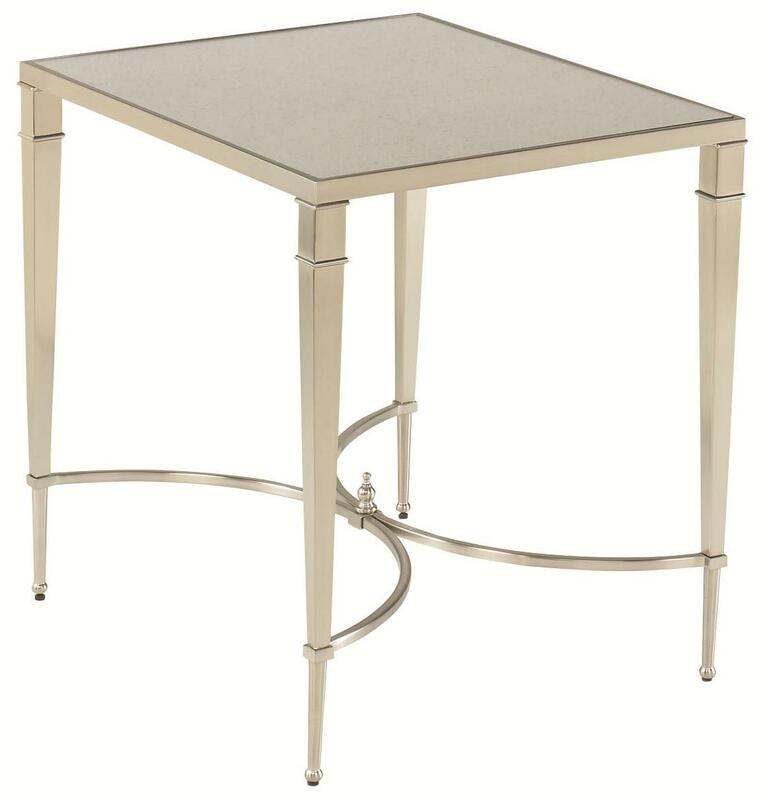 The Mallory Silver Antique Mirror Top End Table by Hammary at Stoney Creek Furniture in the Toronto, Hamilton, Vaughan, Stoney Creek, Ontario area. Product availability may vary. Contact us for the most current availability on this product. Accent your home with a charming set of occasional tables with the Mallory collection. 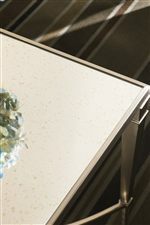 Each piece is finished in a silver nickel to instantly brighten up any room or living space. Reflective mirror table tops feature an antique treatment for a subtle vintage touch perfect for displaying flowers, artwork, and room decor. 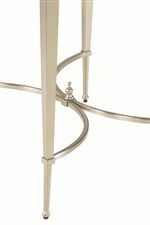 Graceful curves mixed with straight tapered legs complete each piece for a look that can easily transition between casual and formal settings. Get that quaint cottage look you've always wanted with the Mallory accent table collection. The Mallory collection is a great option if you are looking for Cottage Cottage furniture in the Toronto, Hamilton, Vaughan, Stoney Creek, Ontario area. Browse other items in the Mallory collection from Stoney Creek Furniture in the Toronto, Hamilton, Vaughan, Stoney Creek, Ontario area.